Enjoy 8% off (on top of current 10% promotion) on your next Health Screening Package (PUBP 13, PUBP 3, PUBP 20) when you volunteer with ImpacThor at least once! Promo Code will be emailed directly to qualified volunteers. No need to make a redemption here. Step 2: ImpacThor will send you the Promo Code. Step 3: Visit this link: http://deals.getdoc.co/#/. Step 4: Purchase Health Screening Packages from the page. Step 5: Key in the Promo Code and pay. 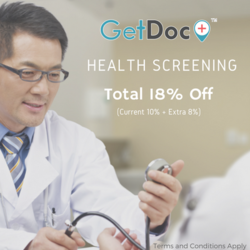 Step 6: GetDoc will send you a Voucher via email. Step 7: Print it out and redeem it at one of our panel clinics. (For all our panel clinics, see: http://bit.ly/panelclinic). Step 8: Undertake the health screening which will be followed by basic consultation in the clinic when the result is out. Voucher sent by GetDoc via email only redeemable when printed out.